My kids really impressed me today. We started talking about Place Value, reviewing what they should know from second grade -- Ones, Tens, and Hundreds. Usually, despite the fact that this is NOT new material, it's like teaching a brand new topic. Today, though, my kids showed me that they had it down cold. And not just one class! BOTH classes went pretty similarly, and we sailed right through things. I started off by writing the number 979 on the board and asking somebody to read it. I then asked them to discuss with their partners whether or not the two 9's in the number meant the same thing. I heard great discussions, and in both classes, kids told me that they were not the same because the first 9 was equal to 900 but the second 9 was merely 9. When I asked about the 7 in the middle, a good majority of the kids were able to not only tell me that it represented 7 Tens, but even that that equaled 70!! That's pretty major!! I busted out the place value blocks, and the kids started modeling 2 and 3 digit numbers. For the most part, they did this with ease, and one great surprise was how well they worked with their partners and did not just play with the blocks (with one or two unsurprising exceptions). But then I posed a tricky question. I asked them to model 63, which they were able to do easily. I then asked them to show me with the model how we could represent 63 - 5. I asked them to take away 5 cubes from their model. Most of the kids had difficulty with this one. However, in my morning class, I heard one of my kids immediately launch into a PERFECT explanation to his partner of how they needed to "exchange" one of their ten sticks for ten ones cubes and then they would have 13 ones and they would be able to take away 5. Color me incredibly impressed. After a few minutes had gone by, and it was obvious that the other kids were stumped, I had that kid come up to the overhead and share his explanation with the whole class. In the afternoon group, nothing was quite as powerful, but I observed a few groups doing the right thing. When I asked them to explain, it took a little bit of coaxing and drawing it out of them, but they had the right idea. Tomorrow, we introduce Thousands, and Thursday, we'll introduce Ten Thousands and Hundred Thousands. I can only hope things go as smoothly then! We got a bulletin in our mailboxes today, beginning with, "This year, two of the courses that are mandatory for all campus staff members will be online. The courses, Confidentiality and Ethics, will be accessible and available 24 hours a day, 7 days a week." This makes it sound like we can access the programs at any time and fulfill the requirements at our leisure. Until I read further and saw that the window for completing the Confidentiality course is August 16-28. Yeah, 24 hours a day, 7 days a week really doesn't mean jack when you're told about the MANDATORY course the day before the window closes. They finally fixed my air conditioning! I think. Today was quite a bit cooler, due to a nice rainstorm this morning, so that may have skewed my perception. But for a while, the unit was running, and it was nice and cool. I turned off the fans and closed the windows. Later in the afternoon, it seemed a bit warmer, but still not nearly the sauna that it had been. What a relief! This year, there is a kindergarten class on the 3rd grade hallway. This is not exactly optimal space planning, in my opinion, but it is what it is. Our hall's bathroom schedule thus includes this kindergarten class, and of course, they happen to go immediately preceding my class. This morning, I took my class down to the restroom at our appointed time, and the kinders were still down there. As we stood there waiting for them to finish, this little boy walked out of the bathroom with his pants down around his ankles and his tighty whities visible to the whole world. This kid wasn't showing the appropriate level of embarrassment that one would expect from someone with their drawers hanging out. He wasn't looking around the hall wild-eyed shouting, "LOOK AT ME!!!" but he also seemed ready to get a drink of water and get in line in his condition. I figured since there were no other men around that I should step in and handle the situation. I gently escorted the lad back into the bathroom to get things taken care of, telling him, "Come on, nobody needs to see that." Getting him taken care of was trickier than it seemed though. For one thing, his pants were down below his knees, but they were still buttoned up and belted up. He started tugging them up, and they wouldn't go over his hips. He also didn't seem able to undo his belt to loosen them up enough to pull back up. I finally realized that I would have to actually get my hands dirty, so to speak (would this be wet work? ), and I helped with his belt. He at least was then able to unsnap his pants and pull down his zipper so that he could get his pants back up to, well, pants level. But then he couldn't get the zipper up. So I had to help him with that too. And with getting his pants closed again. And with getting his belt done again. Once again, I confirmed the notion that I would NOT be a good or happy kindergarten teacher. Today was our first day of school, and if you've ever read Harry Wong's "The First Day of School," then you know that it's best when everything is planned out in advance, and there are no major surprises. This would be pretty much the total opposite of my school's first day of school. Also, you may be giggling at the name Harry Wong right now. Our day was actually full of chaos and mayhem and unexpectedness. Instead of just narrating the day, I thought I'd pick out the top 10 moments and express them in list form. 10) Having people walk in and out of my classroom all day long to check out the air conditioner. The motor was working all day long, and if you held your hand 2 inches from the vent, it appeared to be blowing out cold air, yet the classroom remained at 85 degrees. I'm not really sure why the 2 guys inspecting it were wearing hard hats, but I guess there's no such thing as TOO safe? 9) I was able to offload a few handfuls of my leftover wedding M&Ms before classes began. My morning duty was monitoring the 3rd grade hallway, so I told the kids that I would give a few M&Ms to each student in the quietest class. There were two classes that I figured this would make no impression on whatsoever, and I was right about them. But the other four classes WERE very quiet, which was especially great seeing as how it was the first day, and they didn't know the usual routine. The class who won never asked me who "John and Tamara" were, or what was special about "July 2, 2010." They just shoved the candies in their mouths. 8) Despite the district going to a computerized attendance system, we learned in our meeting after school today (yes, a meeting after school -- memorable moment 8.5) that we would still need to turn in a folder with a headcount each day. We are to a paperless system what Hummers are to Green cars. 7) Getting called out of the 3:15 meeting to meet with a parent who didn't know where her child was. This boy was not supposed to get on a bus, yet he may have, instead of going to parent pick up. The lady eventually went home to see if he was there, and I never heard anything more, so I am assuming she found him. We'll know for sure tomorrow. 6) One of my students from last year coming up to me after school and giving me a hug. I am sorry to admit that I did not remember her name (I remembered it later), but it was nice to see her. 5) After-school bus duty was hectic and hot. It was about 104 degrees outside, and I was out there for about 20 minutes, due to several missing kids. The kids were finally found, but my buses were the last to leave, and I probably lost about 10 pounds through sweat. Also, there are usually 6 faculty members monitoring the first two buses, but today my buddy Ed U Cater and I were the only 2 out there between both buses. Not sure what happened to the others, but I have a feeling it had something to do with our bus duty never being officially announced. 4) The cafeteria ceiling collapsing. We were told to have lunch with the kids in the classroom, and things were delayed for a while, but I didn't find out until a little later the reason why. It seems a few sections of the ceiling fell (leak? gas? bigfoot? ), narrowly missing one class of students. 3) The announcement at 2:55 that "the brother or sister of so-and-so needs to go to room 202 to pick up so-and-so." Turns out that the sister (cousin, really) was in my class, and that earlier, I had needed to send her to the office with a message. And she hadn't known where the office was, so I had to send another student with her. Yet here she was, being asked to find a room on the second floor, in the 5th grade wing. Thankfully, at that time, the 5th graders were walking by on their way out to the buses, so I snagged one and sent my student with her. 2) The teacher break room now looks like a high-scale Starbucks. There are fancy tables and chairs, the walls are bright colors, complete with trim, and the lighting is soft. It's good to know that I may not have working air conditioning in my room, the hallways were just painted last week, and our cafeteria may need to be condemned, but at least I can have lunch in style. Priorities. 1) My kids. It would appear that I have a really good group of kids this year. There were several on both rosters that did not show up, but of those who did, there were only a couple that gave me any problems today. One kid fell asleep, and a few others couldn't stop talking and playing. But other than that, they listened, they did what they asked, and when we did a fact family triangle, they completed the fact family with little trouble. I hope this trend continues! School starts tomorrow, so good luck to everyone who is kicking off a new year, whether tomorrow, next week, or sometime in the past! Also, Learn Me Good is featured today on Spalding's Racket, a British book blog. Maybe people in the UK will start buying LMG, now that they are getting Kindles there! Well, after a week of preparation at school, I can say I'm just about ready for the kids' arrival on Monday. I say just about, because yesterday at 5:30, when I had to force myself to leave, I know that I still had a few things I wanted to move around. I figure I can do that on Monday after school, though. The important things are in place. Desks are arranged the way they should be. Textbooks are inside desks. Accountable talk stems, math strategies, spelling words, etc are visible on the boards. Pencils are sharpened and in the cup. Air conditioning is... well, non-existent as of yesterday. But since my SCHOOL has A/C, my room apparently takes a back seat in the district's mind to all of the other schools that are entirely without. I can sympathize with them. I mean, after all, they've only had 2 months and change to fix these cooling problems. Hopefully, they'll get around to me by Christmas break. Also, it's nice to see DISD not waiting till the last minute to make improvements to my school. There was a whole crew of guys painting the hallways this week, and I for one am certainly glad that they did not wait until NEXT Monday to start. Because setting up an 83 degree classroom swimming with paint fumes is one thing, but having to TEACH in an 83 degree classroom swimming with paint fumes AND students would have been horrible. Thursday night, we had a Meet the Teacher night, and so I got to meet a few of my charges. I didn't meet anyone that seems like a holy terror, so hopefully that is a good sign. Now I just need to type up my lesson plans, think through a few procedural things, and get a good night's sleep tomorrow! 1) This week's Education Buzz Carnival is up over at Bellringers. Even more great posts than the last time, and we all know how great the last time was!! 2) Most excellent blogger David Wisehart has posted an interview with yours truly on his site. About a month ago, I came across a post by My Teaching Spirit about practicing the routine for small group activities with students on the first days of school. I thought it was great, as one of my weaknesses has always been finding the time and knowing HOW to do small groups. Her methods were clear cut and gave clear student expectations, and the kids got to see the RIGHT way to do it and the WRONG way to do it. This morning, part of our staff development was a presentation on The Daily 5. This is a program, mainly aimed towards reading, that our district is mandating for K-2. The upper grades are encouraged to give it a try. The presenters went over how to talk with the kids and get student-generated criteria for reading to themselves, and then we had 2 faculty members act out the RIGHT way to do it, and the WRONG way to do it. It was nearly the same from blog post to presentation this morning! So either the blogger at My Teaching Spirit has independently developed her procedure and it just happens to be exactly like the Daily 5, OR she is familiar with the Daily 5 and has adapted the procedures from reading to her math class. Either way, it's a great demonstration that these procedures can be used for just about any subject! I am looking forward to trying them out in my own class, as my goal is to get stronger in small group instruction. I even have a horseshoe table in my room for the first time ever! I'm hoping that's the first baby step in a long series of them. I apologize to everyone who is experiencing long loading times for this blog. I've noticed it too, though it seems to only be the background that is taking a long time and not the actual content, which makes it bearable. I hope this is what everyone else is seeing too. Today was our first official day back to school, Operation: In-Service. In Dallas, we always go back for 5 days of staff development before the kids come for their first day. I showed up around 7:40, as I had been promised breakfast, and on that matter, I was not disappointed. Some tasty breakfast burritos and a cup of OJ later, and I was a happy (er) camper. However, things were not cool with my classroom. Literally. It was already 102º today, yet the heater was running full blast in my room. It should have been the A/C running, but it was blowing hot air, and when I opened my door, I felt like a victim from the movie Backdraft. Needless to say, I shut the "A/C" off, but the room didn't get much cooler. Thankfully, I wasn't in my room much as we had other things on the agenda. Item 1 on the agenda was the mystery field trip. We had received an email from our principal last week saying that we were getting on buses and going somewhere, and that we should wear sunblock, shades, and a hat. If you noticed my earlier statement -- it was freakin' 102 degrees outside today -- you might guess that we were not especially pleased to hear that we would be outside for any amount of time. A few people had guessed at where we would be going, and they were correct. In conjunction with the planned "Meet the Teacher" night this Thursday, we visited our students' apartment complexes and passed out fliers announcing the event. Now, if I had been in charge of this field trip, I would have gotten a list of apartment numbers at each complex where our kids lived so that we weren't putting fliers on doors of people who had no kids at our school. Or I would have assigned certain people certain sections of each complex to go to, so that even if the wrong doors got knocked on, at least they weren't being knocked on 2 or 3 or 4 times. Or, most likely, I would have just thought of these things and not done anything, and things would have gone exactly like they did today. The buses pulled up the first complex, teachers grabbed a handful of fliers, and we all started randomly walking around the apartments, knocking on doors. A few people did report getting yelled at by people who were awakened (hey, I would have been asleep at 9 too, if I hadn't had to report to school), and several were greeted by people in various states of undress. I was walking around (aimlessly) with a colleague when another group of teachers called to my colleague to come see a former student. This girl had been one of MY former students the year before, so I went as well. As we walked over, I recalled that this former student, while SUPER sweet, was also the cousin of one of my worst kids from last year. This was the child that I yelled at so loud last year that the other teachers in my hall all asked about him by name. Sure enough, as we approached, I see both the little girl and the little boy hanging out the apartment door. The little boy, A, sees me and yells, "MISTER TEACHER!!!!" and runs over to give me a big hug. We visited 4 apartment complexes in all, and I can say that the Disney World vacation prepared me well for this morning. Walking around in extreme heat without letting the back sweat overwhelm me. At our third stop, after the excursion, most of us had gotten back on the bus, and we were waiting for one of the teacher's aides to come back. As she came within sight, so did a mother and her four children. We had seen several people come outside while we were around to talk to us and get fliers, so we figured this was happening again. The TA went over and handed a flier to the mother and said a few words that we couldn't hear, but we presumed pertained to Thursday night. She then turned and got on the bus. So did 2 of the kids. The lady wasn't out there to get a flier, she was out there to put her kids on the school bus! Our TA didn't even realize the 2 kids had followed her onto the bus until we started laughing and telling her to turn around. And the kids were just looking for an empty seat, like it was perfectly normal to see a bunch of grownups wedged into the seats. After lunch, we blessedly stayed inside. Last year, we had done an activity where we had to choose what animal we were most like and then discuss in that group what our qualities were. Fun. I was an owl. This year, we did an activity where we had to choose what shape we were most like and then discuss in that group what our qualities were. The choices were square, circle, triangle, and squiggly line. I put myself in the squiggly line group for no discernible reason other than that I feel I'm sometimes a bit unusual. But I soon came to the conclusion that I was in COMPLETELY the wrong group. Several of the traits that people in my group wrote were "Creative," "extroverted," and "party animal." Yeah, not really me. I should have been in the square or triangle group, for sure. Ah well, day 1 is done. And even if I HAD been a square, after returning to my super-heated room for a bit of arrangement definitely melted me down into a squiggly line. A really quick question -- is anybody else having difficulty loading this page? Is it taking longer than it should? Today is my last day of not having to get up and go to work. Wow. What a great summer, but it ALWAYS seems like the summer is just not long enough. Plus, I'm a master procrastinator, so I've only just started doing the things I should have been doing all summer. I finally started working consistently on a sequel to Learn Me Good. I've updated my T-shirt store. Now you can choose your color, and there are many new styles, including neon, heather, and women's cuts. Also, some pretty cool grocery totes! I also really need to get on the ball and film a video for the song I recorded LAST YEAR. I don't want to give the whole thing away, but here's a hint: It's a parody of a pretty popular Justin Timberlake song. I think I'm going to visit my classroom today and at least arrange the furniture the way I want it for the year, maybe get a few bulletin boards started. But then tomorrow is going to be a lay out and read by the pool day!!! Here in Texas, we go back to school next week for our 5 days of teacher in-service, then the kids show up on the 23rd. That's public school, anyway. My nephew goes to private school, and they started today! To start getting back into the swing of things, I thought I'd post an old Mr. Teacher column from Education.com that ran back in August of 2008. This column was titled Practice Q&A. Here in Texas, the brand new school year just started yesterday. Class has been in session for a while in a few other places, and some kids don't begin until next week, after Labor Day. Since we're all at or around the first week of school, though, I thought I'd do a small service for all the parents out there and provide a few questions that their kids might be asked, along with examples of good answers and bad answers. This way, you can prep your kids on what to expect and how to get in the teacher's good graces. For instance, the teacher may ask your child, "What is your name? "A GOOD answer would be, "Edward," or "Donisha," or whatever your child's real name is. A BAD answer would be, "My peeps call me Mac Daddy Zeno, the Pokémon Playa!" Another question might be, "How did you spend your summer?" A typical GOOD answer would be, "It was fun. We went to Sea World and Cici’s Pizza, and I got a new puppy!" A rather BAD answer would be, "My dad got caught trying to smuggle illegal fighting llamas into the country, so we visited him every Thursday from one to four at the Henderson County lockup. Also, my new puppy smells like paint thinner." The teacher will probably ask, "What did you learn last year?" Your child is providing a GOOD answer if she replies, "I learned my times tables, I learned how money is made, and I know the capital of China is Beijing. "Conversely, your child is giving a BAD answer if he responds, "I learned that you can jimmy the lock on a teacher's car in five seconds with clear cover and the proper equipment." Teachers often ask if their students know their parents’ phone numbers. A GOOD response to a question like this might be, "Yes, we practice it every night in case of an emergency." A BAD response to this question might be, "Yes, but I never call that number because it's $4.99 for the first minute and $1.99 for each additional minute." Out of concern for safety, a teacher may ask your child, "How do you get home after school?" GOOD responses to this question are, "I take the school bus," or, "My granny picks me up out front." The answer of, "My mom's friend ‘Stinky’ usually picks me up on his rusty old Yamaha. We have to share a helmet," would definitely be a BAD answer. Of course there are many other questions that teachers will be asking their students this week and all year long. Hopefully, this little primer will help guide your efforts in getting your kids ready to put their best foot forward. One word of advice -- I would suggest practicing these questions and answers with your kid yourself. Results might not be so good if you leave the practice up to "Uncle Stinky." Amazon announced a couple of days ago that they were making books on Kindle available to customers in the United Kingdom. This means that if you live in England or the surrounding countries, you can have Learn Me Good on your ereader for less than 2 pounds (or 2 quid, as the young blokes say)! I'm not sure how much of a hassle it was for Amazon to translate Learn Me Good for the UK readers, but I have confidence that it was done right. There, that should do it. Welcome UK readers! Check out Learn Me Good on your Kindle today! The brand spanking new first edition of the Education Buzz Carnival is up an running over at Bellringers! This midway will undoubtedly grow over time as more people become aware and remember to send in their entries, but this first carnival is chock full of sawdusty, funnel cakey, grease painty goodness! From Dancing Crocodile (and how can you just not love that blog on name alone? ), a comparison between kids in the classroom and a pack of wild animals. Pat (Loonhiker) ponders why kids sometimes ask questions that seem a bit. . .dopey. I hope to have something to enter for next week! In the meantime, check out these and the other articles at Bellringers! Now that I'm back from all of my world travelling (Disney World, anyway), and school is about to start back up -- shockingly soon for some folks -- I figured I better get back into the swing of blogging on a more regular basis. Not once per week, and guest bloggers at that! So I took a look around at some other bloggers to see what they were doing. Carol over at My Bellringers has jump started up the old Carnival of Education. This is something that really hooked me into the "edusphere" when I first started blogging -- I even hosted a couple (this one was my fave) -- and it's a shame it's gone away. But it's super fantastic that Carol has revived it! Joel at SYWTT is gearing up for the new year as well, with this great guest post and THIS great guest post! As for me, I'm busting out my copy of The Cornerstone and brushing up! Holy cow, it's August already!! 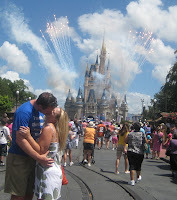 Yeah, me and the new misses (and the rest of my family) just got back from a 2 week vacation to Disney World yesterday. While technically not a honeymoon, we treated it as such, and broke away from the family unit pretty often. 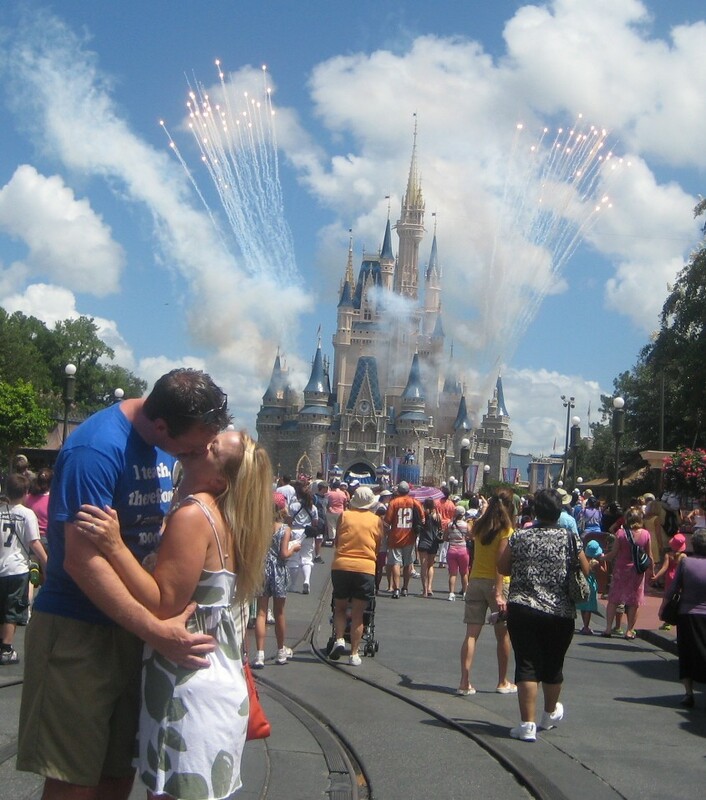 Personally, I LOVE Disney World. It really ignites the little kid that lives in my heart. I can't look at Mickey Mouse without a giant grin breaking out on my face. And I love the rides! Though nowadays, I'd be hard pressed to answer which I love more -- the rides themselves, or the photos that are snapped midway through them. One of my absolute favorite rides -- the Tower of Terror -- snaps a picture of the elevator occupants on one of the final drops. My brother and I must have ridden that thing a dozen times, each time coming up with some new shtick for the photo. Jazz hands. Playing dead. Fist bumping. Taking off my shoe and smelling it. Yeah, I pity the poor soul who actually PURCHASED one of those pictures for framing at home. And now I'm back home again, with *GASP* only two weeks of freedom left before reporting back for the new school year! I plan on getting a jump on those remaining two weeks tomorrow, starting with sleeping in till noon.